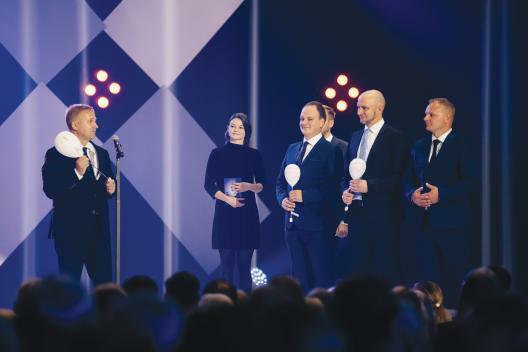 Estonia’s “Company of the Year 2018”, “Innovator of the Year 2018” and “Design Applier of the Year 2018”. School friends Arno Kütt (48) and Peep Kuld (46) are implementing their mission of freeing up the valuable time of hundreds of millions of people all around the world at incredible speed. By the end of this year, these men from the small Estonian town of Viljandi will have saved the time of 130 million Americans. In autumn 2018, the automated parcel producer Cleveron opened its new factory extension in Viljandi. Cleveron develops and produces automated parcel terminals and parcel robots, selling them in various countries around the world, thereby shaping the future of logistics. Estonians are well-acquainted with these machines: Estonia is the land of parcel terminals. Most of us prefer to send and receive parcels via self-operating smart terminals, which we can see all over our shopping centres. These terminals were first introduced only a decade ago by Cleveron’s predecessor SmartPOST. Before that, we used to go get our parcels at the post office. Cleveron started out with basic parcel terminals: the same “made in Estonia” lockers, which are in use today in over ten countries, including Finland but also Brazil. Those terminals are now “yesterday” for Cleveron. 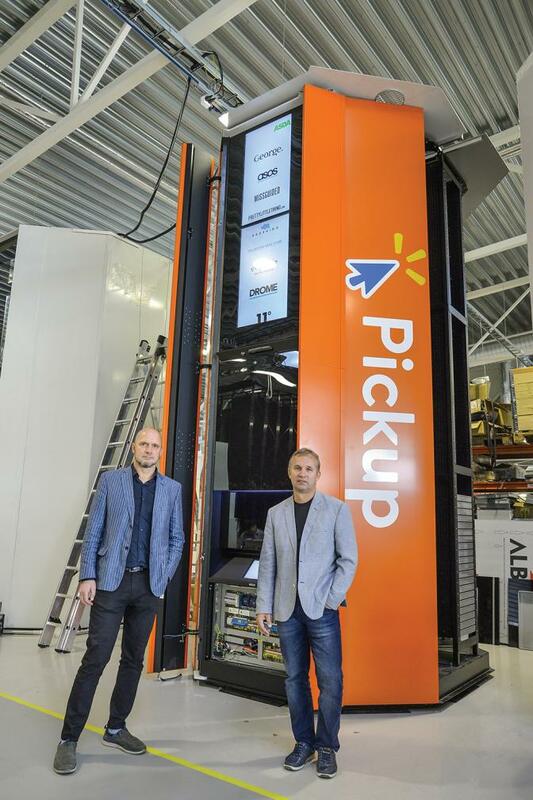 Their current main product is the five-metre tower PackRobot, which accommodates up to 500 parcels and issues them to customers through a small “oven opening”. This has made the receipt of products ordered online very user-friendly. Peep Kuld, co-founder and Business Development Manager of Cleveron, says that PackRobot is in mass production and it is “as reliable as a Kalashnikov”. Whereas today the factory in Viljandi produces about 4-5 PackRobots per day, this number should at least double within a year. The first towers were installed in stores of the US retail giant Walmart in the beginning of last year. Americans are so busy picking up their online purchases that by the end of this year the “parcel Kalashnikov” will be installed in more than 700 Walmart stores all over the USA. Considering that the cost of one machine is nearly 50 000 US dollars, this amazing deal with Walmart brings tens of millions of dollars for Cleveron. But the vision for the next seven years is to sell 15 000 parcel robots in America. 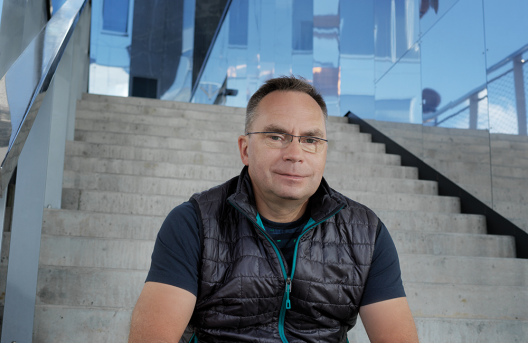 Peep and Arno wish to make Cleveron the most valuable company in Estonia, but say that this is not a goal in itself but rather a result of global success. In addition to Walmart, Cleveron has also signed a deal with the world’s largest retailer Zara. Cleveron’s next generation parcel terminals are being installed in the largest Zara stores all over Europe. Those are no longer towers, but cuboid-shaped parcel units that are installed in stores in a similar way to integrated dishwashers. Except that these robots are the size of a house, they deliver up to one thousand parcels a day and the computer knows to exactly which “floor” and “storage unit” the right parcel needs to be delivered. Peep and Arno explain that Zara customers tend to order online and then come pick up their products in the store. Online sales have really grown and people tend to come pick up their parcels at the same time, during the evening rush hour, which jams up the checkouts. Parcel delivery through personnel is annoying, expensive and time-consuming. In contrast, a parcel robot enables people to easily receive their parcels by themselves. ‘Our robot works and the owner of Zara says that everything is perfect, regardless of the fact that this product is partly still in development, that sometimes we need to cross cultural barriers with communication and also put out some so-called fires,’ says Peep. Consumers have received the Estonian robots so well that customers in Spain, Italy and Great Britain no longer call it a parcel terminal, but a cleveron. For example, they say: you can get your parcel from the cleveron. Hence Cleveron is producing cleverons. Cleveron’s new products are receiving much attention globally. For example, when Cleveron’s courier drone delivered a beverage bottle flying over the Viljandi Lake last summer, it was broadcast by the news agency Reuters. The story was seen by 40 million pairs of eyes. But also, journalists from Thailand and Singapore come to Viljandi. ‘Our activities are really in focus. Responsibility and expectations are growing,’ comments Arno. It is not just the media investigating Cleveron’s activities, but also industrial spies. Arno explains that, for example, the Chinese take a photograph from the Cleveron homepage and upload in onto Alibaba, as if they are selling the same product. Cleveron has in such cases contacted Alibaba, asking for such offers to be removed and Alibaba has done so. But the Chinese are still a headache for the company. Two Chinese companies have copied the Cleveron parcel robot and not only taken it onto the market, but also patented it in China, hence blocking Cleveron’s entry to the Chinese market. One of the Chinese “clones” of Cleveron is trying to develop cooperation with the national post company and the other with Alibaba. One Chinese company once sought to collaborate with Cleveron. The company representatives expressed interest to represent Estonian products in China and they came to visit the production facility in Viljandi. The negotiations went on for a while. ‘Apparently the point of all these negotiations was to get as much information as possible from us. One of the men who came to Viljandi had three buttons on his suit jacket, the middle one larger than the others. I really wanted to go and pull on that button, but I didn’t do it. Fortunately, we had put our biggest secrets out of sight,’ says Arno. Up to this day they get requests from Asia asking to buy just one parcel robot. But Cleveron always refuses, knowing that this robot would be taken to pieces and copied. Peep and Arno say that design cannot be protected in China. According to Chinese legislation, a copier can only be prosecuted when they admit to having copied a product. It is for this reason that Cleveron didn’t apply for patents in China. It would have immediately provided designs for the “pirates”. ‘We predicted the fact that there would be copies. But we really didn’t foresee that the Chinese would patent our product and therefore lock the Chinese market for us,’ says Arno. Cleveron is in the middle of Chinese court- and patent proceedings, and Arno and Peep believe that those will have positive outcomes for the company. They also learned their lesson in Russia. It is there that Cleveron used to have one of its first paying customers, who bought over a hundred parcel terminals. The collaboration ended with the Russians dismantling the machine and copying it. Cleveron remains one step ahead of “copiers” by really focusing on product development and bringing out new perfected robots onto the market. ‘We release a machine today but we have already worked on it for years,’ explains Arno. Work is also underway on really innovative future solutions. Cleveron is developing a drone that will be able to land just above the smart post box and drop a parcel in it. The company is also focusing on robot couriers – special additional equipment for self-driving cars enabling a robot to do the work of a courier. For some time, Cleveron was orbited by the giant Amazon. But in the end the Viljandi men refused the deal. They could not come to an agreement with the Americans. Amazon wanted all parcel robots to carry the Amazon name instead of Cleveron, asking the Estonians to give up their intellectual property with no obligation to actually buy from Cleveron.‘Those were quite ridiculous conditions. They did not suit us at all,’ explains Peep. Cleveron invested millions of euros and extended its production facility in Viljandi in order to fulfil the increasing orders. In 2019, this factory will produce 10 large parcel robots per day. The rapid growth in orders creates big challenges for the company. A parcel robot consists of approximately 6000 details, all of which need to reach Viljandi from Cleveron’s partners at the right time and without compromising on quality in order for the machines to be assembled and transported to the other side of the world on time. ‘Running the production side is a huge challenge,’ says Arno. 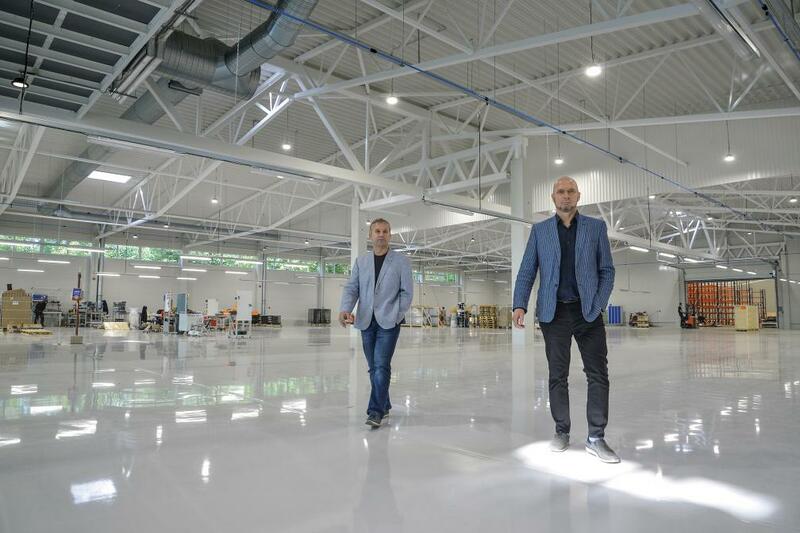 In October, Cleveron opened an extended production facility in Viljandi, thus multiplying their production space. The office staff, who were previously working in close quarters in their rapidly growing company, now have broader and more comfortable offices. Cleveron’s goal is not just to sell as many automated parcel terminals as possible, but to change the world by giving people the gift of time. Arno and Peep calculate that if 130 million Americans use Cleveron parcel terminals by the end of this year, each one of them wins at least 15 minutes of extra time. In total then, Estonians have saved Americans 3700 years. Cleveron is a company that signals to society what it is that we value in Estonian business. It is exactly the kind of company we want to see in our economy. Cleveron’s strengths are their product development and -design solutions, targeted work, productivity and innovation. In addition, Cleveron is based on Estonian capital, produces outside the capital and significantly contributes in its staff. To summarize, it can be said that Cleveron is in every aspect worthy of the title “Estonian Enterprise of the Year”. This article was first published in the special journal “Best Estonian Companies 2018”.